It is Thanksgiving week in the United States, which means it’s a short week for many. I can sense the eagerness to get out of the office, so here’s a short, helpful idea to finish out our month. Centerpieces can be a source of stress for gala chairs. I’ve been involved in discussions around the size and cost of a centerpiece. Once I witnessed two gala chairs in a feisty debate about the style of the centerpiece. A friend of mine tells a hilarious (?) story about how live fish were used as part of the centerpiece at a sit-down dinner gala. Shortly before the ballroom doors opened to allow guests to enter, staff noticed that many of the fish were floating on the water. Some had projected themselves from their bowl onto the table and were already drying to death. An improper water pH had killed the fish. What about the stress of having centerpieces that are a combination of donated and rented items? Here’s what my client did to solve that. 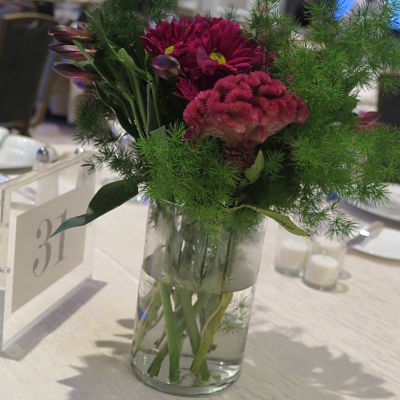 Many thanks to <donor> for enabling the beautiful centerpieces for the ballroom tables. The vases are on loan to us, so please leave the vases on the table. You may, however, remove the flowers from the vases and take them home to enjoy when the Gala ends this evening. When the vessel needs to stay because it’s rented, but you know those flowers should be enjoyed after the gala by guests, communicating your message in this way is quick and effective. Sure, you can go to the added work of putting a star on someone’s plate or program to identify them as the lucky winner of the centerpiece, or you can encourage the largest donor of the night to take home the centerpiece. There are also games you can play to award the centerpiece. For instance, this past weekend, the student-made centerpieces were sold to the highest bidder at their respective tables, generating a few thousand more dollars for the charity. But for quick and easy dispersal of flowers while keeping the vessel, this works.